The timing of molar emergence and its relation to growth and reproduction in apes is being reported by two scientists at Arizona State University's Institute of Human Origins in the Dec. 28 online early edition of the Proceedings of the National Academy of Sciences (PNAS). From the smallest South American monkeys to the largest African apes, the timing of molar development and eruption is closely attuned to many fundamental aspects of a primate's biology, according to Gary Schwartz, a researcher at the Institute of Human Origins and an associate professor in the School of Human Evolution and Social Change in ASU's College of Liberal Arts and Sciences. "Knowing the age when the first molar appears in the mouths of most primates allows researchers to predict a host of life history attributes, such as gestation length, age at sexual maturity, birth spacing and overall lifespan," said Schwartz. "Humans are unique among primates because our life histories are so slow and thus our molars emerge relatively late. Given that apes are our closest living relatives, understanding the broader context of when the characteristic slower development of humans evolved is of great interest." "We've known quite a bit about the timing of molar development in chimpanzees, which is important because they are our closest living relative. However, we've known virtually nothing about when this important event occurs in other wild-living ape species – until now," said lead author Jay Kelley, a research affiliate at ASU's Institute of Human Origins and an associate professor in the Department of Oral Biology at the University of Illinois, Chicago. Because of the difficulties in obtaining tooth emergence ages from animals in the wild, Kelley opted for other means; he searched for specimens in museums. At the Zoologische Staatssammlung in Munich he found skulls of a wild-shot orangutan (Pongo pygmaeus pygmaeus) and gorilla (Gorilla gorilla gorilla) that preserved emerging first molars. 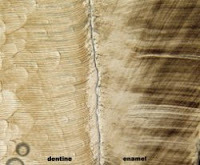 "Like annual growth rings inside trees, the cells that produce teeth (both the enamel and underlying dentine) leave behind a trace of their presence, not as annual markers, but as growth lines that appear every day," said Kelley. By slicing the teeth in half, he and Schwartz were able to examine these incremental growth lines in ape individuals that died as their first molars were just erupting into their mouths. "Because teeth preserve this phenomenal internal chronometer, we were able to count up how many days it took the first molars to form," said Schwartz. "In apes and monkeys, first molars start forming very close to the time of birth. As the first molars were still erupting in our specimens, development was incomplete and the final growth line was laid down on the day those animals died. Therefore, by counting backwards from the final growth line to the day of birth, we determined their age at death and thus the age at which that molar was erupting." Using this novel approach, the two scientists were able to mark the age of the gorilla's first molar emergence at 3.8 years, nearly identical to that of a wild chimpanzee's. The orangutan's age at first molar emergence was surprisingly much later, at 4.6 years, which falls closer to the age of approximately 6 years in modern humans. "We were excited to discover this much older age for the orangutan, since orangutans have much slower life histories than the other two great apes," said Kelly. However, he and Schwartz caution that though the later emergence age in these large Asian apes is closer to that for modern humans, these latest findings should not be taken to indicate some special evolutionary relationship between the two. "Rather, it is in keeping with what you would expect given the relatively slow pace of growth and long period of infant dependency that evolved separately in the lineage leading to orangutans and that leading to modern humans," said Schwartz. The work by Kelley and Schwartz also has implications for understanding the evolution of human life history. "We can use the same techniques to calculate ages at first molar emergence from the fossils of early hominids that just happened to die while their first molars were erupting," said Kelley. "The close correspondence between age at first molar emergence and the timing of life history events that we found in great apes and modern humans means that we can have confidence that first molar emergence ages in the early hominids will provide equally accurate knowledge about their life histories."